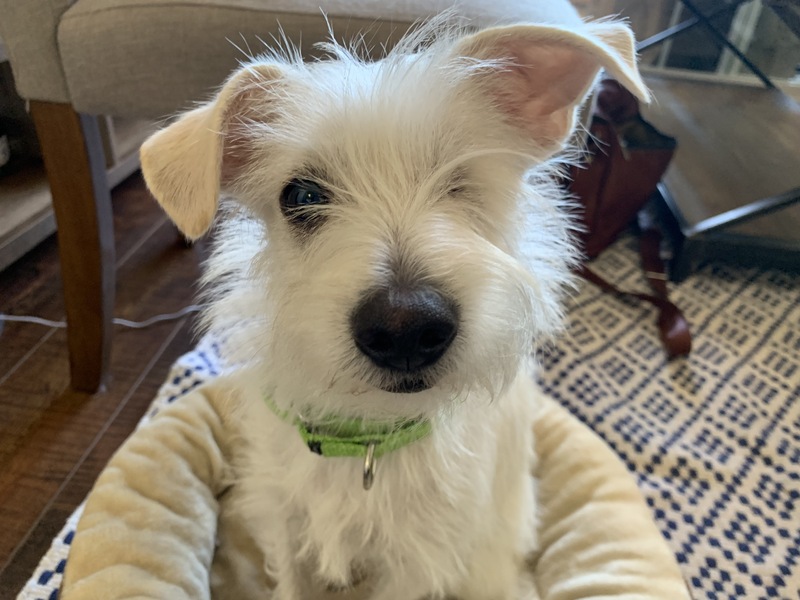 For this Los Angeles dog training session, we shared a tip to stop 10 month-old Terrier mix Odie from getting upset around unknown people and pulling on the leash. Odie lost an eye due to an infection prior to being adopted, but that doesn’t slow him down a lick. He is a typical high energy Terrier. He was a little stand offish at the start of the session, but I used some tricks Ive picked up as a LA dog behaviorist to earn his trust and build a positive association with him. Because Odie sometimes acts aggressively to people he doesn’t know, I went over some things guests should and should not do with him. Id like the guardian to practice having friends over a few times a week for the next month to help practice being around guests in a positive way. One of these would be to meet outside and go for a walk first. More on that later. After asking about his background and dog behavior problems, I shared a number of tips that will help Odie start to adopt more of a followers mindset. I think some of his aggressive behavior is territorial and coming from his belief that he is in charge of security. The more his guardian enforces rules, rewards desired behaviors and increases his structured exercise, the more he will adopt a follower’s mindset. I went over a few positive dog training exercises like hand targeting and the focus command. These are easy to teach but only work with practice that gets progressively more challenging as the dog develops the skill set. The focus will be something the guardian uses on walks so it will be important to paster it inside up to 15 seconds, then repeat outside the apartment then while moving on walks. One of the activities that should really help Odie is what I like to call a structured walk. This is a controlled walk where the dog is next to the human with a balanced energy and in control of itself. This walk actually started inside the apartment by making sure Odie was calm during the leashing process. This is often a step people skip, but a dog’s energy before they leave the house has a direct correlation with the behavior they will offer on the walk. You can get some tips for taking a dog out on a structured walk in the free dog training video below. By making sure Odie was calm before the walk, using the special twist of the martingale and paying close attention to his surroundings and body language, his guardian reported it was one of the best walks she had with him. The more practice human and dog get with these structured walks, the better and more comfortable both will get with them. Id like to see the guardian incorporate the walk with some guests who come over to help the dog practice having positive interactions with new people. The benefits of being outside (distractions and open space) combined with forward movement will all help the dog stop feeling like strangers aren’t to be trusted. WIth enough practice, the dog will start to see new people as a good thing as they always accompany a walk. Stopping a dog from acting aggressive to people is all about ensuring that the dog feels relaxed and comfortable. Flipping the leader follower dynamic is a big part of this dog rehabilitation process. So is practicing with new people often who follow the same approach I used and detail in the video below. We wrapped up this in home LA dog training session by shooting a roadmap to success video that you can check out to get some free dog behavior tips that I shared with Odie’s guardian.